The fieldforce is increasingly considered the conductor of all channels for their target customers, leveraging F2F, email, remote engagement, web visits…and providing & leveraging key customer insights in the process. MCM Rep strategy, hands-on training, change management & motivation, and KPI setting & monitoring are the keys to success. Across Health provides experience-based hands-on guidance to improve the use & impact of remote detailing. Also referred to as ‘remote detailing’ or ‘web calls’— teledetailing is the process of conducting interactive, online, real-time meetings with healthcare professionals (HCPs). As technologies such as Skype and Facetime have become an integral part of our personal communications, remote professional communications between pharma companies and HCPs will likely increase. Teledetailing will be adopted as a significant complement to face-to-face (F2F) visits, especially towards ‘digital native’ HCPs. This trend will also accelerate as physician access becomes ever more difficult. In some (mainly Northern) European markets, sales reps often do as few as 2 calls per day. Additionally, in markets like the Netherlands and Sweden, reps are only allowed to see HCPs to present a new product after an explicit request by a physician. Teledetailing is a great way to extend reach or contact frequency and create impact. Across Health provides experience-based hands-on guidance to improve the use & impact of tablet detailing. 6 years after the introduction of the iPad, tablet detailing is now the number 1 digital tactic in the industry, with 78% of companies using tablets to support their sales reps in face-to-face conversations with customers. And almost all companies have selected the iPad as the ‘device of choice’. Despite this rapid uptake, tablet detailing had a rocky start. Many reps felt uncomfortable using them, as they were not immediately convinced that tablets would add impact to their conversations, especially as very often the content was not built to add value and interactions with HCPs. Many HCPs also failed to see the added value in using tablets, as they were confronted with sales reps who were struggling to plough through detail-aids containing dozens of different screens – causing them to lose focus on the actual conversation. The success of tablet detailing depends on generating value for the HCP as well as efficiencies and growing customer knowledge at the company level. 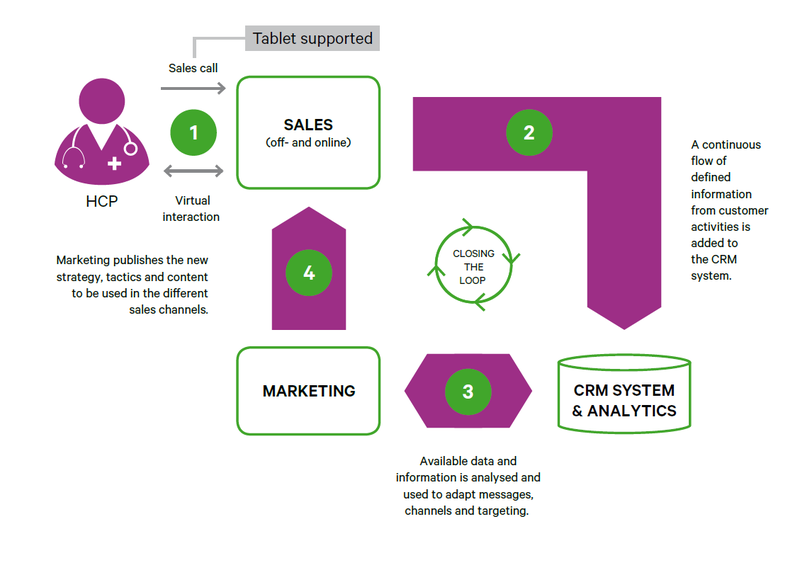 Design thinking, setting up an actionable 360° customer identity in the CRM system, ensuring a smooth partnership between marketing, sales and BI/IT, and data quality is a key success factors to driving impact from tablets – and ultimately Closed Loop Marketing. However, making it a “default” channel after each visit will soon lead to “channel churn”, with physicians opting out massively. At Across Health we can help you design the right strategy and execution enablers for the above as well as other rep-led channels, to maximize rep adoption AND customer engagement.